Gov. Brown yesterday appointed two CalSTRS board members with decades of experience in law and financial firms, a first step toward an ambitious pension reform plan he issued in October to end abuses and cut costs. One of the points in the governor’s 12-point plan calls for increased “independence and expertise” on pension boards, now often dominated by public employee union representatives and their allies. Critics contend that overly optimistic earning forecasts were used to justify major pension increases a decade ago. Supporters told legislators the increased pension costs would be covered by CalSTRS and CalPERS investment earnings, not taxpayers. “In the past, the lack of independence and financial sophistication on public retirement boards has contributed to unaffordable pension benefit increases,” said Brown’s plan. An investment banker appointed by former Gov. Arnold Schwarzenegger to the CalSTRS board, David Crane, was denied confirmation by the Senate in 2006 after repeatedly questioning whether earning forecasts would cover future pension costs. The Senate leader at the time, Don Perata, D-Oakland, told the Los Angeles Times the job of CalSTRS board members is “only to protect members’ benefits,” not to worry about the long-term effects of the benefits on the state budget. A Brown news release said the appointments of the two Democrats “add significant public and private sector financial expertise” to the board of the California State Teachers Retirement System. Michael Lawson, 58, of Los Angeles, has been an associate and partner at the Skadden Arps law firm from 1980 to this year. He was a staff attorney at the Pension Benefit Guaranty Corporation from 1975 to 1980. The Harvard Law School graduate serves on the board of Morehouse College and the Advancement Project. Paul Rosenstiel, 61, of San Francisco, is a principal at De La Rosa & Co. Investment Bankers. He was deputy state treasurer from 2007 to 2009 and public finance director for First Boston from 1986 to 1995 before originally joining De La Rosa. The Stanford MBA is chairman of the California Budget Project and a board member of the USC Keston Institute for Public Finance and Infrastructure Policy. The appointments require Senate confirmation and the compensation is a $100 expense payment per meeting. The terms of three of the 12 CalSTRS board members expire this month. The board has had two vacancies since February, when Brown pulled two last-minute Schwarzenegger appointees. One of them was a co-author of a report last year that helped put the spotlight on public pension earning forecasts. A widely quoted Stanford graduate student report said the debt of the three state pension funds is $500 billion over the next three decades, not $55 billion as reported at the time. The students made the calculation using a risk-free earnings forecast based on government bonds, 4.1 percent, rather than the earnings forecast used by CalPERS, CalSTRS and UC Retirement, which ranged from 7.5 to 8 percent. The Stanford students, working under the direction of former Assemblyman Joe Nation, D-San Rafael, said economists say a risk-free earnings forecast should be used because the debt or “unfunded liability” is risk free, guaranteed by taxpayers. Support for using risk-based earning forecasts to report pension debt has come from, among others, the Congressional Budget Office and a brief issued last year by the Center for Retirement Research at Boston College. A new brief issued by the Boston research center this week takes one of the first looks at how new rules proposed by the Governmental Accounting Standards Board might appear to sharply increase public pension debt. The funding level of CalSTRS plummets, dropping from 71.5 percent to 38.9 percent. The funding level of the California Public Employees Retirement System, which already applies one of the big changes, only drops from 62.6 percent to 56.3 percent. The study concluded that the total funding level for 126 large state and local public retirement systems would drop from 77 percent to 53 percent, well below the 80 percent considered acceptable by some experts. The report by Alicia Munnell, Jean-Pierre Aubry and others is intended to alert policymakers about how the new rules could appear to sharply reduce pension funding levels, often used in judging financial health. “It would be unfortunate if the press and politicians characterized these new numbers as evidence of a worsening of the crisis when, in fact, states and localities have already taken numerous steps to put their plans on a more secure footing,” said the report. The study applied two of GASB’s proposed changes. One would allow pension funds to continue to use their earnings forecast for assets expected to be available to offset or “discount” future pension obligations. But if the assets fall short, the pension fund would presumably have to borrow to cover the remainder. So to reflect borrowing costs, the fund must switch to a lower government bond-based earning forecast for the rest of the obligation. The other GASB change would value pension fund assets at market rates. Pension funds “smooth” their gains and losses over several years to avoid big swings in annual contributions from employers and employees. CalPERS already uses the market value of its assets because it has a 15-year smoothing period, about three times the industry average. CalSTRS uses a three-year smoothing period. Unlike most California public pension systems, CalSTRS cannot set its employer contribution rate, needing legislation instead. A spokeswoman said the new accounting rules would not change the way CalSTRS calculates its funding needs. “Although the liability may be reported on a financial balance sheet as a new, significantly higher amount, the actual current shortfall of $56 billion projected by CalSTRS would not change as a result of any action taken by GASB,” said Gretchen Zeagler. CalSTRS officials have urged lawmakers to begin phasing in a contribution increase, arguing that delay increases costs. 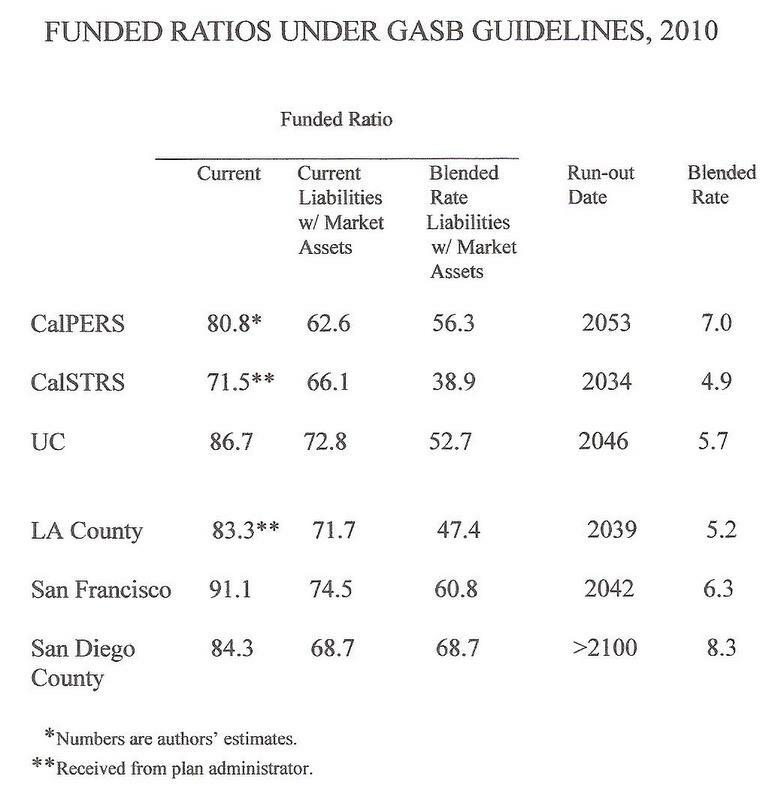 Brown’s 12-point plan does not address the CalSTRS shortfall. GASB is expected to issue rules next June, effective a year later for big plans and two years later for others. At a hearing in San Francisco in October, CalSTRS and CalPERS asked for a delay, saying more time is needed to prepare for the change. This entry was posted on December 1, 2011 at 8:38 am and is filed under Funding, Funding gap, GASB, Reforms. You can follow any responses to this entry through the RSS 2.0 feed. You can skip to the end and leave a response. Pinging is currently not allowed. WOW, IS THAT THE UNDERSTATEMENT OF THE YEAR!!! Teddy and see are going to be disappoitned! Why would I be disspointed that Brown appointed two people with financial knowledge to a pension board? “Well, that tells you you’ve got a Ponzi scheme, because you have to keep bringing in new members and the current system itself is not in a sustainable position,’’ Brown said. The CalPERS position is the right position. JB stated, in his campaign rhetoric, that he supported the DB pensions, but he wanted to be assured, that they were actuarial sound. CalPERS will convince him, that all of the funds need, to be protected in a DB plan, not just part of the funds. JB will come around. I am a big suporter of JB, Rex–ha-ha. PONZI SCHEME, Brown himself said it! Yes, I did, Rex. I must take advantage of still being able to post on the Times, while I can. Why are you so interested, in how many posts I make? You must be on there, yourself. I hope you are not frankie4, the village idiot. I am not interested in how many times you post, or why or where seesaw, but when you go overboard like you always do it is annoying. I am tired of seeing you parrot the public union talking points over and over and over and over again. No, I am not frankie- I only post as Rex, but I agree with him. If you noticed, it was a dumb cop that got on him………I stopped posting on the LAT several years ago. At least 3 years ago. I have never posted out here at all but it seems like the seesaw and his friends are more correct than the Dog….. and why is he so strangely angry at everyone? Stick around Cormac— we call him the Poodle and mostly ignore him–all you will see are angry barely literate rants and odd jealous hostile dull-normal comments. He posts on a few issues on several blogs– always the same slepy mo. Don’t read my posts then, Rex. I do not have union talking points. I have my own talking points. If you are so irritated, you have the choice to skip the thread altogether, and go on to another one. Lay off the crack pipe, you are delusional if you think you fooled anyone! lol— so now you think I’m Cormac? Wow man—- relax, and maybe post like a gentleman or lady with some respect and maybe these folks won’t be so critical of you? Ya think? And you need to use regular names, “Cormac”….instant Teddy Steals sock puppet give away. lol— wow—– I’m Cormac now ! I hope you are not frankie4, the village idiot. seesaw, frankie does not like you in the least. Im not frankie but I do agree with his coments especially about the police and ff pensions. Poodle— does your illness now require that you delve deeply into the various conspiracies of puppets and trolls? Maybe you’ll find out who is really responsible for blowing up building 7 at the trade center? —keep us posted… Man, you need to talk with someone. hey Poodle—- On another note……Did you ever have any luck finding that cite to the case that abrogates the contracts clause yet? We have to get this brief filed pretty soon and your research is holding up the show. Hurry !!!!!!!!!!!!! Hi “Cormac”….I mean Teddy Steals! Cormac, lay off the pipe, you are really losing it. Hmmmmm…..guess you didn’t find that case cite yet?